One of the biggest themes in the Marvel X-Men universe at the moment is the rift between founding member Cyclops and best selling Canadian bad-boy Wolverine. Their rivalry, previously limited to girls and respect, changed tone under the X-Men “Schism” storyline. Cyclops, an X-man since his teenage years, believed that students at the Xavier School for Gifted Youngsters were defacto soldiers in the X-Men army, and further argued that this was always Xavier’s intention. Wolverine felt otherwise. Amazing X-Men #1 hits the stands this week, and we should all be excited for multiple reasons. A brand new, spanking “#1” issue of an X-Title! Ed McGuinness is drawing the X-men again! Nightcrawler is making his come back to the good ole’ Marvel 616! Thrills, chills, spills, big time action and top shelf fun! 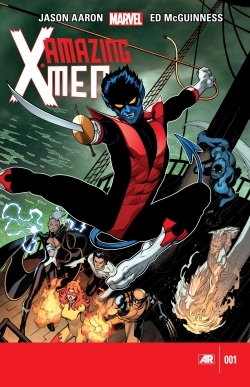 Ah, but here’s the rub; Amazing X-Men will reintroduce Nightcrawler, arguable one of the more iconic and popular current Ex-X-Men, back into the story…after being dead for only three years. Keep in mind that comics, especially Marvel comics, do NOT take place on any real timeline. Kurt Wagner has been dead since 2010, but it might have only been a year, maybe less to the people living in the stories. HOW did Kurt die? He died teleporting Hope Summer to safety in a noble sacrifice…which ultimately meant nothing as two (real-time) years later Wolverine did his best to kill her in order to stop her from merging with the Phoenix. Yes, the same Wolverine who had a falling out with Cyclops because he thought putting children in harms way, even when serving a greater good, was morally wrong. The theme of “Noble death” should sound familiar to long time X-Readers. Colossus died, sacrificing himself to destroy the Legacy Virus, only to come back from death at the beginning of Joss Whedon’s X-Run. Ironic, really, as Whedon himself kills Kitty Pryde, the X-Woman known as Shadowcat, in a self sacrificing gesture. Needless to say, she’s alive right now, too. Amazing X-Men is going to be just that…Amazing. It will be Amazing for all the reasons I mentioned previously, and for all of the blatant, mind hurting logical flaws the X-Tales continue to propagate. X-Men comics are not based on “Making Sense.” The X-Men are the greatest comic book soap opera going, with a history spanning multiple realities and endless timelines. I hope Kurt Wagner, a staunch Catholic, comes back to life through Buddhist reincarnation, mistakenly marries his own dimension hopping daughter from an alternate timeline (Yes, she exists) and they both fall back in time while giving birth to their new son…WOLVERINE! Pick up Amazing X-Men, and let your mind go. You don’t buy an X-Book for logic, kids. You buy an X-book to watch brightly clad weirdoes make the least amount of sense they possibly can. I have bought some comics, also eaten wayyy too much candy.